Misjudging the size of your car | Why you drive bad?! Your car isn't that big! Observing people parking in the parking lot I’ve noticed that people that drive compact cars constantly misjudge how big their cars are. I see these cars with maybe two feet of space in front of the car and the front of the parking stall. 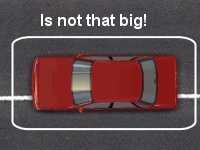 Or while in traffic, they leave a car-sized gap between the front of the car and the vehicle in front. Or they need to make a wide right turn because they think the car isn’t going to make such a sharp turn. Come on people, learn how close you can get with your car! My massive full-size can get into some pretty tight spaces even though it looks like a whale on wheels. It’s because of the perspective while sitting in the driver’s seat. Get over that and you can get closer in to the vehicle in front and stop blocking the turn lane entrance. This entry was posted on Sunday, March 6th, 2011 at 12:46 pm	and tagged with driving, parking, size and posted in car features. You can follow any responses to this entry through the RSS 2.0 feed.